Acupuncture is a form of Traditional Chinese Medicine (TCM) and is one of the oldest systems of medicine that dates back thousands of years. It has become the most commonly used method of healing in the world. TCM is based on the belief that all parts of the body are interconnected. Organs and organ systems work together to keep the body functioning. If one organ or system is malfunctioning, it affects every other aspect of the body. Qi (pronounced “chi”) is the TCM term for vital force or energy. Qi flows through the body via channels called meridians. Excesses and deficiencies, which cause imbalances or interruptions in the flow of qi, cause illness; correction of this flow restores the body to balance. 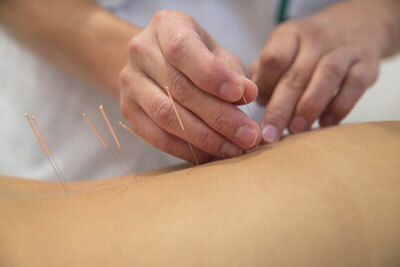 Acupuncture restores the balance, allowing for the normal flow of qi, which restores health to the mind and body. Very thin needles are inserted into points along the meridians to influence the energy flow. Sometimes heat, pressure, or mild electrical current is used along with needles. Most people feel very little sensation, but the area where the needle is inserted may tingle, feel numb, itch, or be a little sore. This is a sign that the energy flow has been accessed. We utilize acupuncture for many ailments, the most common being pain management, obstetrics and gynecology, digestive disorders and as part of a smoking cessation program.